Just about every woman has a love for chocolate. Mine may be a little bit too much, so I have to make sure to watch my intake of sweets. To keep myself in a good range of moderation, I wanted to create a way to portion out my chocolate, but still be satisfied. 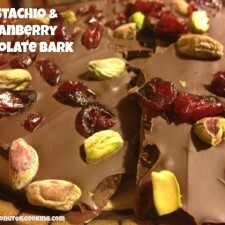 Last night I whipped up a dark chocolate bark topped with pistachios and cranberries that turned out absolutely amazing. 1. Over a double boil, add in chocolate and coconut oil. Stir consistently until the chocolate has reached a smooth and creamy consistency. 2. Line a baking sheet with parchment paper and pour the melted chocolate onto the baking sheet. Spread out evenly with a spoon. 3. Next, sprinkle on pistachios and cranberries. 4. Place in the fridge for 30 minutes to harden. Break apart into desired size pieces and enjoy! With this recipe, you can feel free to add your favorite ingredients. Almonds and shredded coconut would be another delicious idea! 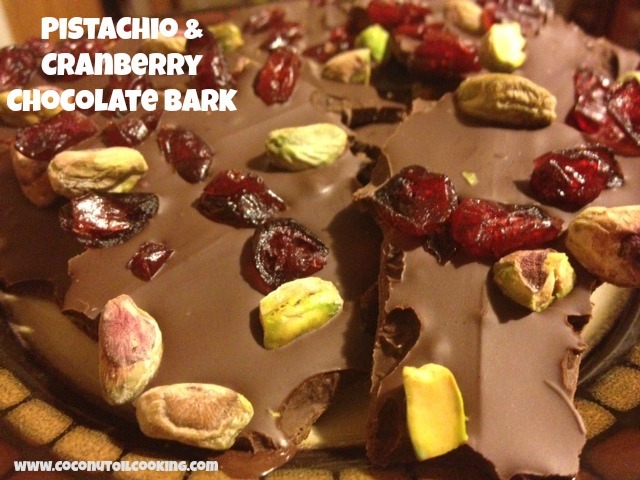 For more delectable chocolate recipes, be sure to check out our Healthy Chocolate Truffles, Dark Chocolate Pretzel Bark, and Chocolate Freezer Fudge. I keep this bark in the fridge and when I need a chocolate fix, I just grab a piece and I’m satisfied.